I hope you had a great weekend! I've been having a wonderful time in Anaheim checking out all the new stuff coming to the crafting scene! Don't forget if you're near Anaheim, stop by the Kitchen Sink Stamps Meet and Greet tonight at the Peacock Inn Suites from 7-9PM! I did a little masking on today's card, using the Kitchen Sink Stamps Multi Step Sunflowers, and 3 Step Itty Bitty Tulip Bouquet. Looking at the card, I'm sure you're asking yourself where's the tulips? Well, I didn't use the Tulips, just the vase from that pretty set! The vase was stamped first, then I masked the water line and top of the vase with Eclipse Tape, then added the Multi Step Sunflower. My sketch inspiration came from last weeks SC264 on Splitcoast. Gorgeous work with this beautiful sunflower, Lisa!! Perfect for this wonderful layout! Can't wait to hear all about CHA! Best wishes for a fabulous Meet and Greet with Kitchen Sink fans tonight!! That is one gorgeous card Lisa! The Dsp you used is lovely!!! Can't wait to hear about all the fun you are having at CHA. Love this wonderful card. Thanks for taking time out of your busy schedule to get it on here for us to enjoy!!! How gorgeous, Lisa! Love the DPs and your take on the sketch! Lisa, you use the Kitchen Sink Stamps so well. Lovely card. 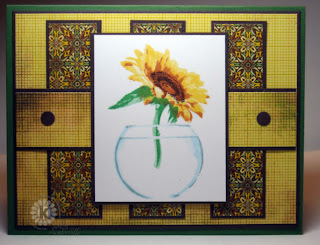 Beautiful card Lisa, wonderful layout for this sunny and vibrant sunflower! ... I think it made the sun come out today! :) Gorgeous!